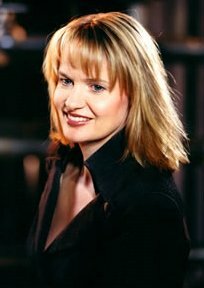 WAIST HIGH: Happy Birthday Anne Dudley. Musician, composer, arranger and producer. Anne's career in pop music started with a meeting with Trevor Horn in the early 1980s. She was the keyboard player and arranger on such records as ABC's Lexicon of Love, Frankie Goes to Hollywood's "Two Tribes," and Malcolm McLaren's "Buffalo Gals," which she co-wrote. Anne was a founding member of Art of Noise, whose pioneering attitude towards sampling was highly innovative and remains influential to this day. Art of Noise are popularly remembered for their collaborations with Duane Eddy, ("Peter Gunn,") Max Headroom, ("Paranoimia,") and Tom Jones, ("Kiss,") but it is tracks such as "Moments in Love," and "Close to the Edit" which have provided the blueprint for the "remixology" age. The group re-invented itself for the Millennium with a stunning album The Seduction of Claude Debussy. Anne has been writing music for films for fifteen years. Her scores include The Crying Game, Buster, and Pushing Tin. In 1998 Anne won an Oscar for The Full Monty score. It is now the highest grossing film in the UK of all time. The soundtrack won a Brit at the 1998 awards and is already a triple platinum album. Anne recently produced and arranged Alison Moyet's hit album entitled Voice, a collection of evocative and atmospheric standards. Alison toured to promote the album in April and May 2005.